I’ve just returned from my third visit with Janice, sole creator of The Dying Show. I spoke to Janice the day before I was due to leave for Philly. The fact that she even answered the phone was pretty amazing. Even more so, the terror she was experiencing was conveyed with the same sense of humor she has always had. Hopped up on morphine, she began by saying, “I don’t know what to do. My address book has now fallen apart, between the P and the Q.” While I struggled with the possible deeper meaning of that statement, she continued by complaining that they serve her tuna in water at the nursing home. “In water?’ she asked rhetorically. “I mean, just water. What’s with that?” I told her I could relate. I’m a tuna-in-olive oil girl, myself. She then introduced weightier matters: “They are trying to kill me here. I accused them of doing that to their faces. For some reason, they didn’t like that.” I agreed that, what with the innumerable other tasks the staff had to do, I was certain that they didn’t welcome being told that they were trying to kill off their patients. Janice followed my comment by getting very quiet and then saying, “You have to believe what I say.” She paused for a moment and continued with “Or don’t believe what I say.” I was grateful to have been provided choices. The last part of the conversation consisted of Janice asking me to call a friend of hers who I hadn’t spoken to since high school. I dutifully wrote the woman’s number down, dictated by Janice. Luckily, the woman’s last name did not start with either P or Q, so the address book page had remained intact. I ended the phone call with Janice, confident that this upcoming third visit would be as memorable as the first. Friday, on the day of the visit, I and my two friends Phyllis and Susan stopped at Steve Stein’s Famous Deli in Northeast Philly, in order to get Janice her requested pastrami on rye. We also purchased a slice of what must be the world’s densest apple cake. There were already bags of chips, a big bottle of Cherry Diet Coke, and a box of Milk Duds in the car. 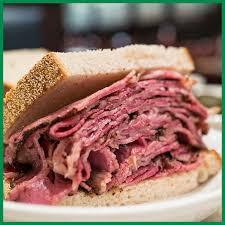 We entered Janice’s room smiling broadly and holding aloft the pastrami on rye and all other food we had brought. We were greeted with a scowling, deranged-looking Janice. Her initial response upon seeing us was at first a grateful “Finally you’re here!” This was quickly followed by “This is not a fun visit! No jokes this time! No food!” It was obvious that Janice had had a very bad night. We put the food down and prepared ourselves to listen. A bad night it had been. Janice talked about loneliness and boredom, about waking in the middle of the night, believing her oxygen had run out and feeling the terror set in, about the staff hating her, about the TV not working and no one caring. Slowly, as all of the fears were spoken aloud and the words were delivered into the ears of people she loved and she trusted, we watched the terror subside. Slowly, the conversation shifted. Janice was being lured toward the possibility that a pastrami on rye, apple cake, chips and humor might fit into the day’s schedule, after all. And then, the ultimate coup: Janice took a bite of the sandwich, asked for a cup of Diet Cherry Coke, and began tossing her irreverence into the universe of the nursing home. Phyllis asked her a question and she said, “That’s a good question. I’ve been waiting my whole life for someone to ask me that.” She then moved on and never answered the question. “That’s a good question” became the theme of the visit. She had no pants on and got out of bed a couple of times, to brush her teeth. Her roommate had family visiting. Janice asked us if it maybe wasn’t appropriate to be half-naked like that, in front of others. We said it probably wasn’t appropriate. Her response was “Right. But I’m hot,” and she walked into the bathroom exactly the way she was. She introduced me to her roommate, describing me as “The funniest person I know, next to me.” She asked her roommate to join us on her side of the room. Her roommate rolled her eyes and said she didn’t have to, as she was able to hear everything that was said from across the room. We didn’t lower our voices, as we continued to talk. Nurses and other nursing home workers began to come into the room. They came, not to perform duties, but merely to visit Janice. Janice held court. She was royalty sans pants, dispensing the same irreverent humor to everyone. A couple of hours into the visit, the nurse administered Janice’s morphine. Janice began to get drowsy. We told her we were leaving, so she could get some sleep. That only made her force herself to stay awake, in order to wring as much as possible out of the visit. We stayed. The final part of the visit was mostly laughs, chips and Steve Stein’s Famous Whatever. Let’s be clear here: Janice’s condition, while certainly having improved since my second visit, in which Janice basically went in and out of consciousness, is still on its downward trajectory. Her weight has been consistently dropping, and she now no longer wants to leave her bed other than to go to the bathroom to brush her teeth (As she explains, “I like to brush my teeth”). Morphine is the great trade-off. It enables her to be more comfortable, but saps her energy and replaces it with incoherence, confusion and, at times, paranoia. Terror continues to be her almost-constant visitor. As we left the room, we were all thinking the same thing, that we had had this day. This afternoon. These hours. These minutes. With an old friend who lived and ate a bit of pastrami and apple cake and made us either think about our own mortality or laugh in spite of it. We know that the days and the hours and the minutes that will come after this will surely follow their own inevitable course. But this day and these hours and these minutes had brought comfort and joy. Such a sad post. Bless you for being there. I’ve been in similar situations and it is so hard. All we can do is to be there for people, to keep the connection as best we can. Renee – I heard yesterday a relative in Chicago had been hospitalized and this resonates – the sense of loss, fear, small graces that we feel as we hang on to life and try to find meaning. I’m sorry for your family member. Yes, there’s a delicate balance between celebrating the life that still exists, while acknowledging that that life is coming to an end. Ah Shelly, writing gets me off the hamster wheel in my head and helps me clarify and focus my thoughts. It’s a gift. Thanks for sharing this. Janice has good friends. So many people avoid the dying because it reminds them of their own mortality. Conversely, I believe remembering we will die helps us live a little more every day. I can’t begin to imagine how difficult it must be to see a dear friend in this condition — but how wonderful that you are taking the time to visit anyway. I’m sure the moments of levity you and Janice shared meant the world to her. My heart goes out to you, her, and everyone who loves her. Thanks, Heide. It’s my way of honoring the friendship we had all those decades ago. It’s a gift to me, as well. Your presence, the best gift you can give her. True, and that goes for everyone. At the end, we all want to know that we mattered to others, right? Well done, friend! Let us all shamelessly wear no pants when we face this! Ah, thanks. It’s been an eye-opener for sure. There’s a lot people don’t talk about, a lot I haven’t written about. We have an idea of what this all means, but sometimes, dying doesn’t look like what we imagined it would. I’m left with the thought that our final days, just like all of the days that preceded them in our lives, have endless possibilities. Thanks, Ilona. This is beautoful. I was telling this to Janice on the visit, that this final journey is one we take alone. This was so very beautiful/sad on so many levels. In my Bible study class, when somebody asks for prayers for somebody who is dying, our leader (who, I’m pretty sure, is an angel in disguise…) always prays for a good death for them. So I pray for a good death for Janice. And for peace. And peace for you too Renee. Thanks so much. Your leader is wise, indeed. I hope the end of her life feels like joy, shouting and laughing. Thanks, Margo. There would be nothing better.